This unique Scottie dog silver tone watch is bound to be one of your coolest accessories! With its sparkly eye and and its cubic zirconia bejeweled-collar, this time-telling pup is sure to draw compliments. 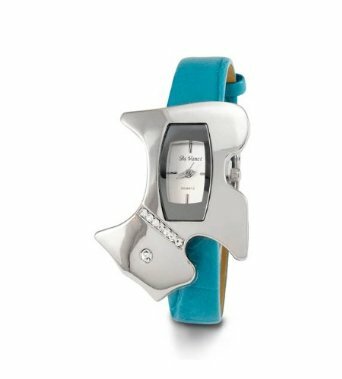 A bright teal band adds to the whimsy of this fun watch. For more information about the Scottie dog watch, click here.